From page 54 (Chapter 2, part 1) of the 1929 Melbourne Plan for General Development, commissioned by the Metropolitan Town Planning Commission. Other highlights include Chapter 2, part 7, which has a bunch of stuff about railways, including a discussion of a railway to Doncaster (page 132) and a strong argument for a combined transport authority (page 143). The budget last night included no funding for big-ticket transport projects in Victoria. This is as I expected — they are now desperately (and misguidedly) pursuing a surplus instead of chasing economic stimulus/growth. And the Feds probably felt Victoria has had its share of Federal transport funding for a while, given they provided over $3 billion for the Regional Rail Link project. Projects like the inner-city Blue Orbital Smartbus, and short extensions of tram lines to connect better with railway stations, which would help people move around the inner suburbs without going via the CBD, improving mobility and relieving the busiest parts of the PT and road network. 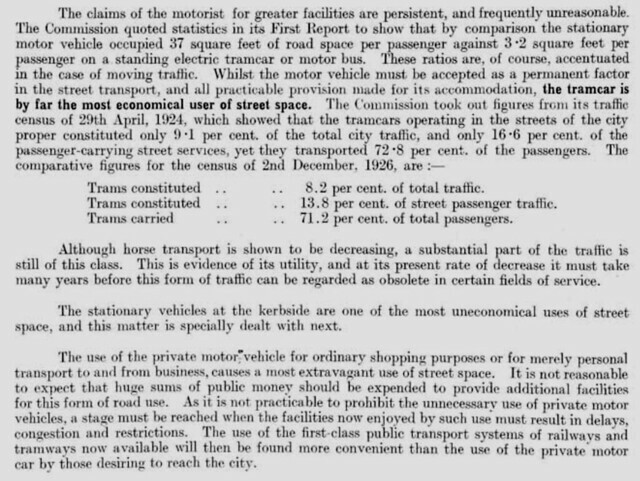 I’m pleased they realised (in 1929) the amount of space taken by cars, particular moving cars. Parked cars take the least space. Moving cars take more (more spacing required with increased speed to ensure safe seperation relative to reaction times and braking). However it’s moving cars with respect to pedestrians that take the most space. Try this exercise when next waiting to cross an unsignalised road (or midblock). Watch for gaps in traffic, especially cases where a safe crossing would have been possible had it not been for one car. Multiply the distance between the car and you by the road width. It can easily amount to several hundred square metres at its peak (which occurs just beyond the point where the pedestrian deems it safe to cross). The space taken is obviously higher with speed. It is also higher with wide or multi-lane roads due to their longer crossing times. A car takes up not only its own lane but the lanes either side. And in some cases lanes going the other way as well, especially if the road has no central pedestrian refuge (a horrid but realistic term!). While a bicycle is thinner than a car, from a pedestrian’s point of view it is more hostile on an open road than a car on a traffic-calmed street. the 1929 extract is a gem. It just shows that nothing changes. That is a truly brilliant find! I calculate from those figures that street passenger traffic constituted 59.4% of total traffic. That document includes an underground tunnel similar to the city loop. A mega-project! And a road whose route looks a bit like the West Gate Freeway and Citylink tunnels. A mega-road! Also around that time, in 1928 there was a proposal to extend the Altona line down to Point Cook, along with the extension to Laverton. A western suburbs proposal! Indeed nothing has changed, except this time it won’t take fifty years for things to get built. Regarding the idea that we don’t need to spend billions because there is capacity that can be “unlocked”, how can the current infrastructure handle the frequencies predicted in the Rowville Rail Study for 2046 evening peak? A train every 2.5 minutes on the Werribee line? A train every 100 seconds at Newport? Every 82 seconds at Sunshine? Mees said the City Loop could handle double what it does now. But we are not merely speaking of doubling the frequencies, more like 3-5 times for some services. Mees does not say the Loop can handle twice what it does now. He says that Flinders St can handle twice what it does now. His points out that lots more direct trains can be run with more efficient timetabling. Mees is also focused on sooner than 4046. He argument is that we should focus on suburban extensions rather than central capacity because there is still a lot of central capacity. The RRL helps free up suburban capacity for the Northern Group and this allows more trains to run on the Northern Group as well as V-Line trains. It means there are 4 tracks to Sunshine to handle all those trains.